So, one day you wake up and realize you've been editing comics for almost a quarter century. It's unclear how that happened, but it can happen. As we get going here at ILLUSTORIA its founder, Joanne, asked me, as the magazine's Editor-at-Large, to talk a bit about where I’m coming from. Way back in 1992 I was a very junior editor at a music magazine called Pulse!, which was published by Tower Records, based in West Sacramento, California. I'd moved to Sacramento from Brooklyn shortly after college to take the job. My main role at Pulse! was editing and writing non-fiction coverage about music and musicians. I also edited the letters page. One issue, in 1992, I introduced a small illustration by a local young comics artist, then still in high school, to the letters page. Much of our letters section was dedicated to people sending in lists of their “Desert Island Discs” — those are the 10 albums they'd want with them if they were stuck alone in the middle of the ocean. This is before MP3s and streaming, and before the advent of the Internet browser for that matter. That all kinda makes me feel old, but when you're working on a magazine for kids, as we are here at ILLUSTORIA, a sizable age gap comes with the territory. 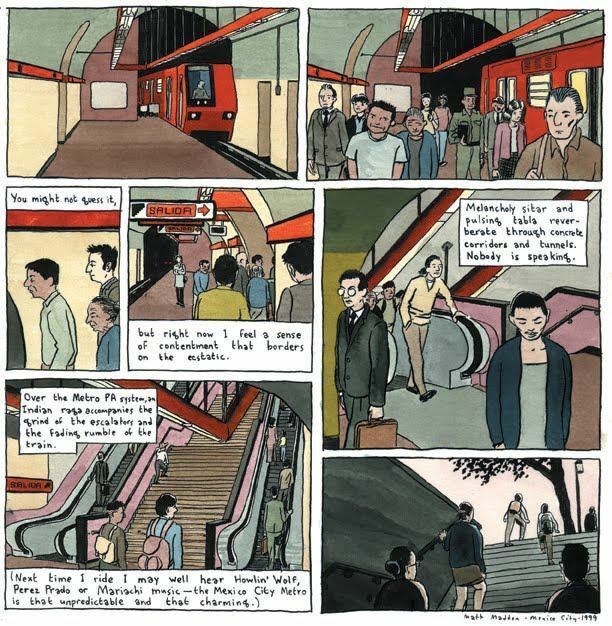 That young cartoonist, Adrian Tomine, turned his illustrations into a monthly strip for Pulse!, a strip he maintained after graduating from high school to attend college. Around the same time, Justin Green, a couple generations Tomine's senior, began a musical strip of his own in the magazine. Titled Musical Legends, it was a trip down Memory Lane, and roads further still off the beaten path. A back-page comic by R. Sikoryak for Pulse! magazine, from 2001. Writing about music, crafting stories about music (and occasionally movies), was my job at Tower Records, and the comics I edited were a means to accomplish that job in a creative way. Sometimes the comics (that’s “comics” broadly defined — some were abstract visual works with barely a hint of narrative) were themselves by musicians, including Marcellus Hall, Damon Krukowski, Naomi Yang, and Jack Logan. Later on I ended up working in comics unto themselves, as Editor-in-Chief of the U.S. edition of the most popular manga magazine in Japan, Shonen Jump, where I had the honor of working closely with editors at the Japanese publication, and getting to meet and interview many of the magazine's greatest talents, including Akira Toriyama (Dragon Ball), Masashi Kishimoto (Naruto), and Eiichiro Oda (One Piece). I learned a lot during my time on Shonen Jump, about cultural differences, national literatures, long-term narrative continuity, facial expressiveness, and depicting action. It was a tremendous time. I've edited other comics projects along the way, including a four-part series for Red Bull Music Academy that involved light touches of animation, and that allowed me to engage with a talented Japanese manga editor and a pair of manga-ka (that's Japanese for "manga creator"). These included the story of MF Doom seen as a superhero comic, from writer Gabe Soria and illustrator Dean Haspiel; a childhood incident of DJ Krush’s, as drawn by Haruhisa Nakata; how Damo Suzuki met the band can, as told by illustrator Connor Willumsen and writer Zack Soto; and a profile of Japanese synthesizer legend Isao Tomita by writer Jordan Ferguson and illustrator Yuko Ichijo. And I had a kid of my own, which is why I was, as a relatively new parent, doubly excited when Joanne invited me to be a citizen of ILLUSTORIA, which I like to think of as a diverse and sprawling city-state built out of comics and other illustrated stories: whether you draw or write or read, you're a full-fledged member of society here. I love Joanne’s sense of comics as a subset of what we're usefully thinking of as “visual storytelling.” As I write this little blog post we're working on the finishing touches of our first issue. I'm getting to assign work to some people I worked with decades ago, some that I've wanted to work with for decades, and some who are fairly new to comics, or at least new to me. In some cases we’re commissioning comics and other art by people who already draw for kids, and in others — and this is especially of interest to me — we’re reaching out to people whose work we admire and wondering if maybe they’d like to consider a kid as their audience, perhaps for the first time. Anyhow, that’s what I was up to before I became a citizen of ILLUSTORIA, and what I’m up to now. We hope you’ll join us. And if you need to reach me, I’m at marc@illustoria.com. These are rough initial character studies for a four-page, full-color piece that Lark Pien did for the debut issue of Illustoria. She loved the idea of sharing this in advance of the magazine's publication because, as she put it via email, "the thumbnails inform people on the process of design and making comics." Her four-pager is titled "Dream Before Building."